Welcome to this year's 26th issue of DistroWatch Weekly! There are a lot of approaches people take to get the most out of their computers. One method is to run systems with a minimal number of features and software packages, focusing on the bare essentials. There are lot of projects which help out with providing a focused environment and we explore some of those operating systems this week. We begin with a review of BunsenLabs Linux, a Debian-based project which runs the minimal Openbox window manager as its default graphical interface. We also talk about OpenBSD, a lightweight operating system which is turning off some CPU features to improve security. Plus we discuss a new, container-focused flavour of Fedora called Fedora CoreOS and announce the release of a handbook for Ubuntu Studio, a distribution designed specifically with multimedia production in mind. We are also happy to provide updates on UBports and its current upgrade to a new base. This past week Debian published new installation media for Debian 8 Jessie and FreeBSD turned 25 and we are pleased to celebrate its milestone. In honour of FreeBSD's anniversary, our Opinion Poll asks how many of our readers either use FreeBSD or enjoy products and services based on the venerable operating system. In our Question and Answers column we discuss the number of people running Ubuntu and why it is so difficult to count them. Finally, we are pleased to share the releases of the past week and list the torrents we are seeding. We wish you all a fantastic week and happy reading! 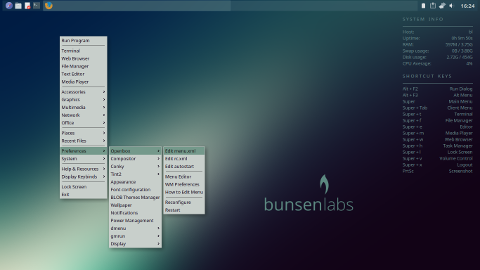 BunsenLabs Linux is a Debian-based distribution that uses the Openbox window manager. The distro was created by the CrunchBang Linux community after its developer announced in 2015 that he was calling it a day. I was a happy CrunchBang user at the time and remember the forum post well. It was one of those "where were you when..." moments. 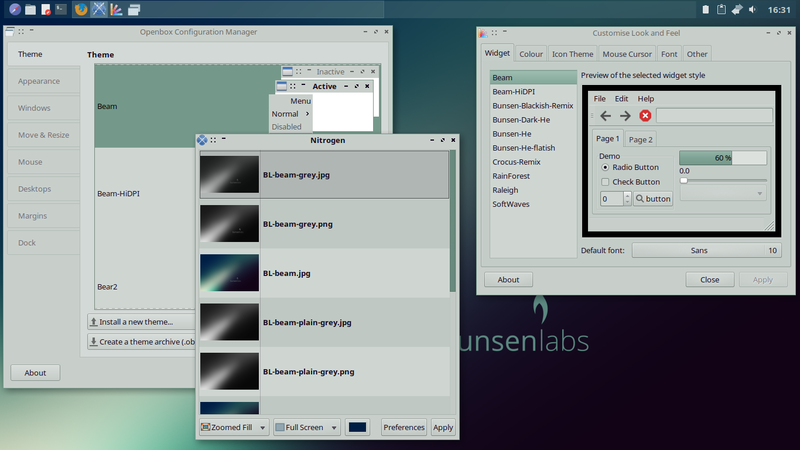 The latest BunsenLabs release has been named Helium and is based on Debian's Stable branch (Stretch). The release announcement acknowledges that it took a while to get this release out of the door - Debian Stretch was released in June 2017 - and there don't appear to be an awful lot of new features. 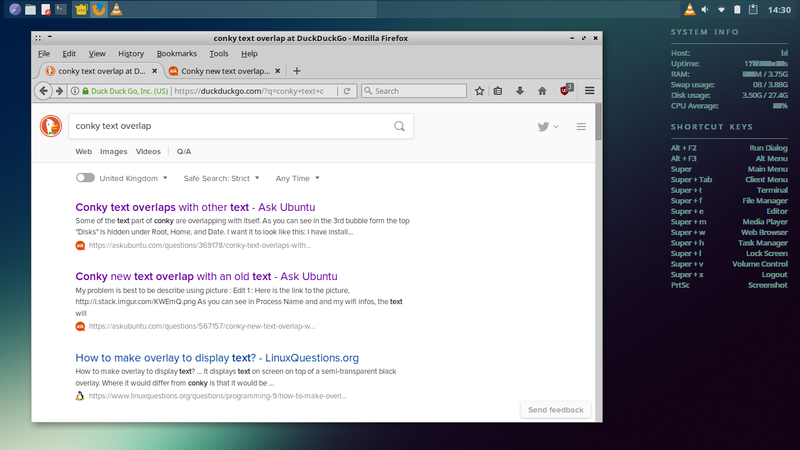 Still, it is interesting to have a look at the current state of CrunchBang's main successor. BunsenLabs is available for 32- and 64-bit processors. The standard ISO is just over 1GB in size, while a smaller CD-sized ISO is available for 32-bits architectures. 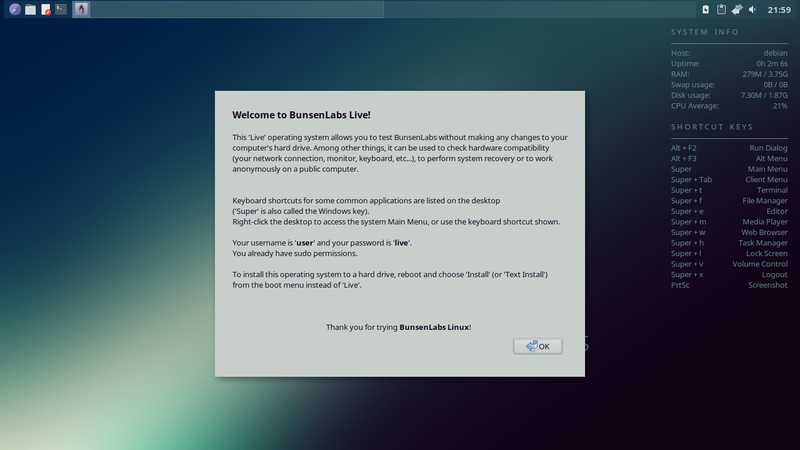 Booting the ISO gives you the option to either run BunsenLabs as a live environment or to launch the installer. There is no option to launch the installer from within the live environment - you will have to reboot your computer and select "Install" from the boot menu. The installer is a slightly modified version of Debian's installer. It features a modest amount of BunsenLabs branding and obviously there is no option to select a desktop environment, but other than that it is all Debian. The installer feels old-school compared with, say, Ubiquity or Calamares, but it does the job. The release notes for Helium mention that the first system boot will be slow, and it certainly was - it took over two minutes to get to Openbox (although that included decrypting the hard drive). Subsequent boots were fast but the boot process itself isn't very elegant. For instance, the GRUB menu is supposed to have a wallpaper similar to the wallpaper used for the login screen and desktop but on my laptop it was rendered in black and white, with greyish blobs where the gradients are supposed to be. As the text in the GRUB menu is white much of it was unreadable. When you first log in you are greeted by an interactive post-installation shell script. The script starts with a warning: we are not supposed to add Ubuntu PPAs or untrusted repositories, nor are we to add repos for other Debian releases. On the remaining screens we can update the system and install various extras, such as additional wallpapers, Flash, Dropbox and even a LAMP stack. If you have ever installed vanilla Openbox on Debian you will know that by default Openbox presents you with a completely black screen. You can open a menu by right-clicking anywhere on the desktop but that is as far as the default feature-set goes. 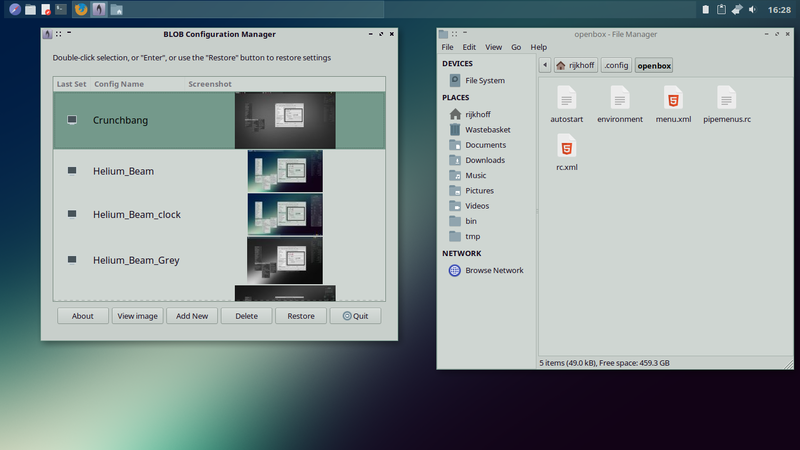 Openbox is very customisable, though, and with the help of other applications it is possible to add things like a panel and wallpaper. BunsenLabs gives you a fully functioning system out of the box. The desktop features a single panel with a "launcher" area (for application shortcuts), a system tray and two workspace switchers / task bars. The combined workspace switchers / task bars are very smart; they not only let you switch from one workspace to the other but also show you which applications are open in which workspace. If you want to move an application to a different workspace you can simply drag its icon to the workspace. BunsenLabs' menu provides access to everything you might need and the items are organised in a logical manner. 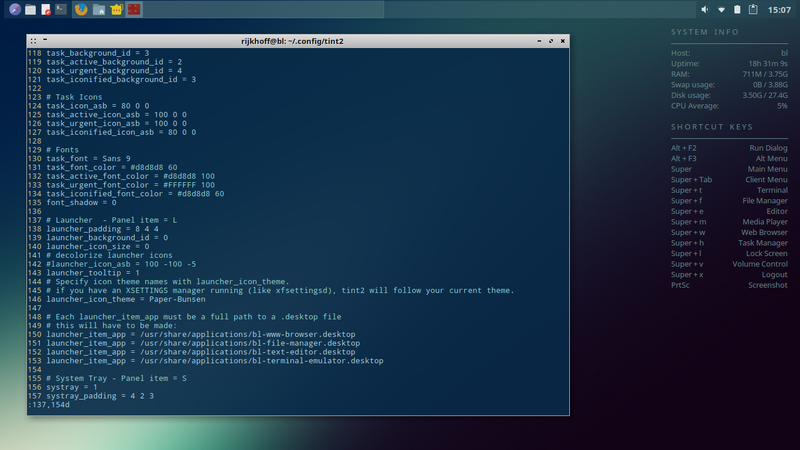 The first item in the list is "Run Program", which opens a basic application launcher (gmrun). This is followed by a list with common applications, a section with common categories of applications (Accessories, Graphics, etc.) and a section for common directories and recently opened files. Towards the bottom of the menu we get various advanced options (Preferences and System Tools) and at the very bottom we find an Exit button. One of the things I like about Openbox is that it is very keyboard-friendly. You can open the menu with either the Super key or the Super-Spacebar shortcut and quickly navigate the menu using your arrow keys. For instance, to exit the system you can simply open the menu; hit either the End or arrow up key to take you to the last item in the menu ("Exit") and hit Enter. An even quicker way to get to the exit menu is to use the Super-X shortcut - there are key bindings for everything in Openbox. Apart from being usable out of the box BunsenLabs also makes it relatively easy to customise the desktop. The menu includes dozens of links to documentation, configuration files and graphical utilities. For instance, under Preferences -> Openbox we get links to the main configuration files, links to basic graphical utilities that can be used to tweak the configuration instead, and a link to information about how to edit the Openbox menu. Helpfully, there is also an option to reconfigure the Openbox menu (which needs to be done before any changes you make take effect). If you are not quite ready to dive into the configuration files you could start with BLOB, a basic configuration manager that lets you switch between various BunsenLabs themes. For each theme you can see which configuration files, icon theme and wallpapers are used and there is the option to save your own collection of configurations. It is a nice addition and it goes to show that BunsenLabs very much encourages you to tweak the system. Personally, I found there was very little I wanted to modify. If this was my day-to-day system I would at some point remove the Conky system monitor from the desktop, although I do like how Conky is partly used to list various common keyboard shortcuts. The only other thing I would remove are the application shortcuts in the panel. They feel redundant and look out of place. 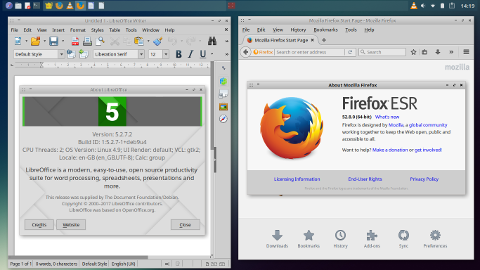 The four launchers open the default web browser, file manager, text editor and terminal emulator, respectively. However, the icons are quite different from the icons for the applications they launch (Firefox, Thunar, Geary and Terminator). The icon for the default web browser, for instance, looks remarkably similar to the logo of the Safari browser. BunsenLabs mainly relies on Debian's repositories and gives you access to non-free packages out of the box. Apart from the Debian Stable repositories there is a BunsenLabs repo containing everything from configuration files to themes and the post-installation script. The repositories and software can be managed either via the command line or by using the Synaptic package manager. I quite like the selection of pre-installed software. You get the Firefox browser, VLC media player, Thunar file manager, Geany text editor and a few accessories, including the Catfish file finder and GNOME's Archive Manager. The only choice of software that I couldn't quite understand was the office software: you get LibreOffice Writer but instead of LibreOffice Calc you get Gnumeric. I guess the developers tried to find a balance between lightweight programs and the best tool for the job. For those who prefer the full LibreOffice suite there is an option in the menu to install just that. As BunsenLabs is based on Debian's Stable branch most of the software is a little dated. Firefox is at version 52 (you get the extended support release, which hasn't moved to Firefox Quantum yet), LibreOffice is at version 5.2 and the distro ships with Linux kernel 4.9. So far I have skipped over the fact that Openbox is a window manager rather than a desktop environment. With the help of the tint2 panel and applications such as Nitrogen (a graphical application to manage wallpapers) and LXAppearance (a graphical utility to customise the theme applications use) it comes close to being a desktop environment. However, there are things that Openbox doesn't do. A good example is the Openbox menu. Applications you install are not added to the menu. Similarly, if you would remove, say, Catfish, you would still have a hard-coded link to the program in the menu. To make changes to the menu you need edit the menu.xml file, either by hand or via a basic graphical utility called Obmenu. It is possible to have a dynamic rather than a static menu. I would argue, though, that it is better to manually edit the menu. It simply offers much more flexibility and it reduces bloat. Menus in "proper" desktop environments tend to list applications which I need but which I never launch from the menu - image and document viewers spring to mind. At the same time it is not so easy to add custom menu items. I might want to add a menu item that opens an OpenSSH session. In Openbox that is easy enough once you understand the menu.xml file. BunsenLabs makes managing the menu a little easier by launching whatever the default application is for a certain job. For instance, when you select Terminal from the menu Openbox runs the x-terminal-emulator command, which opens the default terminal emulator. By default this is Terminator but if you would install xterm and make that default terminal emulator then it would open xterm instead. The same goes for the web browser, file manager, text editor and media player. As an aside, it is for this reason that the application shortcuts in the panel have icons that look out of place. If you would make Chromium your default browser you probably wouldn't want the quick launcher to have the Firefox icon. The point I want to make is this: the menu is simple and complicated at the same time. Early on in my trial I installed both Claws Mail and Thunderbird. I wanted to do this the proper way, so that I would have an item called "E-mail client" in my menu that would open the default e-mail program. After looking into the Debian Alternatives system I found that I instead needed to use a program called exo-preferred-applications to select the default e-mail program and that I could then launch the default e-mail client with exo-open --launch MailReader. I was able to achieve what I wanted but it did require a fair amount of research and the help of the BunsenLabs forums. In a full-fledged desktop environment setting the default e-mail client would be as easy as finding the relevant option in the settings menu. In BunsenLabs, there is no settings menu - you get lots of configuration files and tools instead. There were a few other minor issues I encountered, mostly related to Conky. 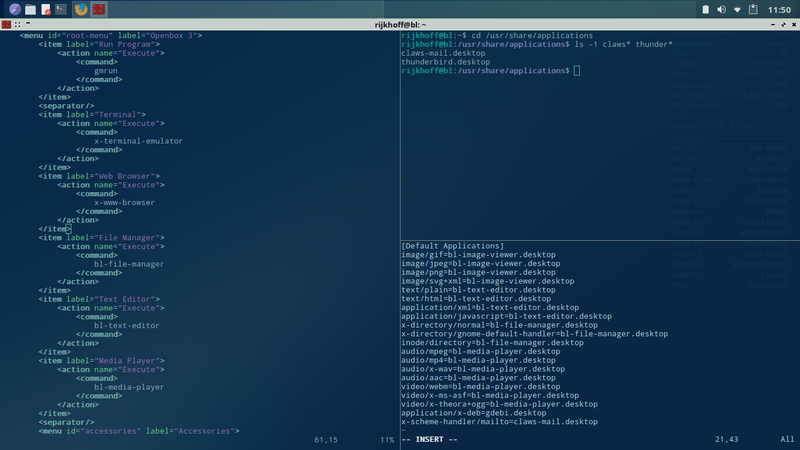 One thing I quickly noticed is that minimising all applications (by pressing Super-D) also minimises Conky. There is no obvious way to restore Conky again but after much digging in Conky's configuration file I found that changing the own_window_type variable from "normal" to "desktop" does the trick. I later found that running openbox --reconfigure to refresh Openbox's configuration files caused Conky to print its output on top of the existing output, which resulted in rather bold lettering. As I have never cared much for Conky I simply uninstalled it (and removed it from the autostart file). If you do like Conky, there is an active trade in Conky configuration files on the BunsenLabs forums. Speaking of the BunsenLabs forums, I should mention that it is a fantastic community. The forums are fairly active and its users are genuinely friendly and helpful. 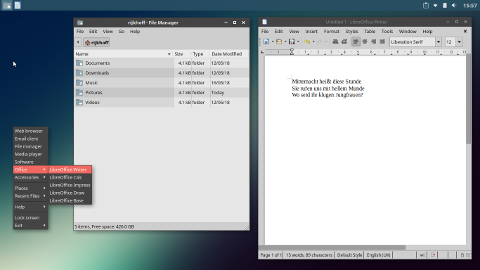 To give an example, after my struggle with the default email client had been resolved someone chimed in to explain a little bit more about exo-preferred-applications (it is an Xfce utility and is used because BunsenLabs also uses Xfce's file manager). I have seen a lot of that on the forums and I like it. People really try to help you find your way. I think it is almost impossible to overestimate the importance of the community. 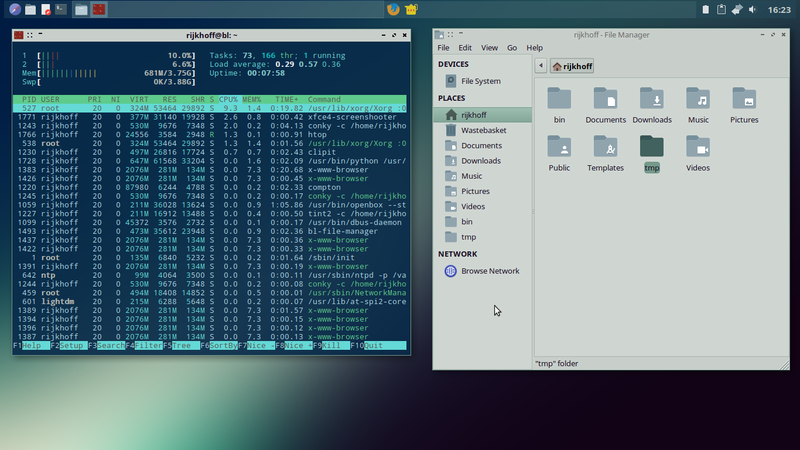 Openbox, tint2 and programs like Conky and Compton are highly configurable and it can be difficult to find the information you are after (even though the documentation isn't all that bad). Making seemingly simple changes can quickly become frustrating, and being able to get help from other users is really nice. I installed BunsenLabs on an old Lenovo G50-30 laptop. I am hoping to give the laptop to someone who isn't particularly tech savvy and has fairly basic computing needs. With that in mind I set out to create an Openbox desktop that is easy to use and free from bloat. I wanted to get rid off some advanced features such as the second workspace, install a different theme and have a menu that contains only items the person is going to need. By and large customising Openbox was straight forward. There are various graphical tools but they aren't really needed if you are happy to dig into the various configuration files. Tweaking the desktop took a few hours and I was able to achieve most of what I wanted. The only thing I haven't quite figured out is how to make it easier to update the system. I want the laptop's new owner to never ever see a terminal window. 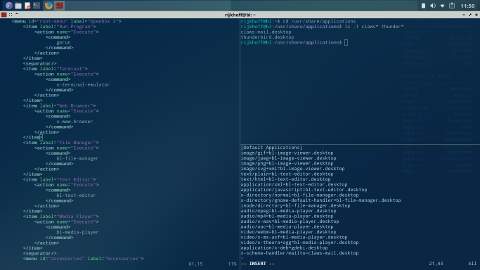 The most obvious alternative is Synaptic but, much as I like the package manger, it isn't exactly user friendly. I might look into unattended upgrades as that would fit nicely with the aim of keeping things simple. For the moment though, I have opted to add some help files using YAD. I discovered YAD while digging into BunsenLabs' Openbox menu. The utility can be used to display the contents of custom help files. In other words, you can create a simple text file and add a YAD command to the menu to display its contents in a native window. I have got a bit of soft spot for Openbox. I like how minimalist it is and how it hardly uses any system resources - according to my Conky panel BunsenLabs was using just over 200MB of RAM when idle. BunsenLabs provides a system that is usable out of the box but which can be tweaked any way you want. For this review I made the system cleaner and leaner but I could have gone in the opposite direction and create a desktop with conkies, panels and docks all over the place. DistroWatch's slogan, "put the fun back into computing", very much applies to BunsenLabs. In short, this is a distro I could easily use as my daily driver. My only concern would be the project's long term future. 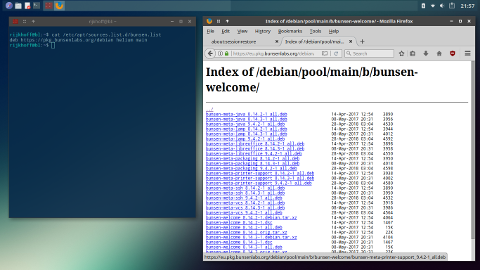 BunsenLabs Helium was released almost a year after Debian Stretch was released and then there is the worrying fact that Openbox doesn't work under Wayland, which is getting ever closer to replacing Xorg. BunsenLabs has got a sound community though, so I very much hope this distro will be around for many years to come. BunsenLabs Linux has a visitor supplied average rating of: 9/10 from 76 review(s). 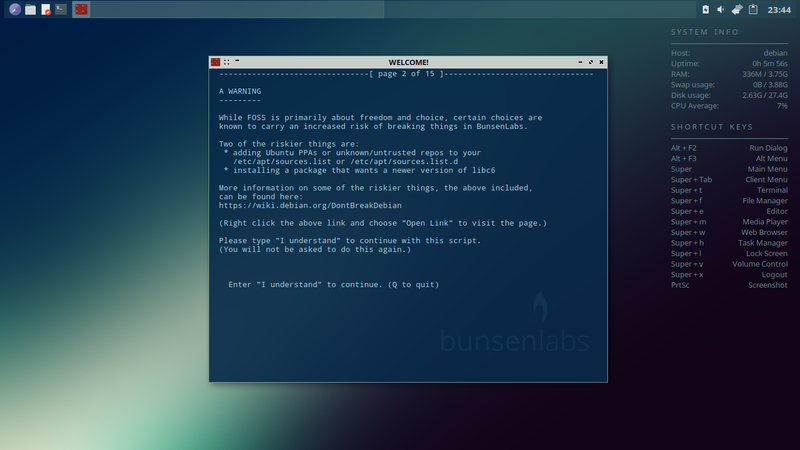 Have you used BunsenLabs Linux? You can leave your own review of the project on our ratings page. The UBports team is in the process of testing a new release candidate for their fourth over the air update (OTA-4). The new development snapshot is a major one as it represents a jump from the old Ubuntu 15.04 code (which Canonical no longer supports) to the newer 16.04 LTS codebase which is still supported upstream. "The main reason why the arrival of OTA-4 seemed to take so long is because Ubuntu Touch switched its base to Ubuntu 16.04 LTS Xenial Xerus. This is a mammoth milestone for the project, because it allowed us to transition from the unsupported Ubuntu 15.04 Vivid Vervet to a Long Term Support (LTS) base. Being able to build on a supported Ubuntu version is very important, because we are now receiving core package updates directly from upstream - from the larger Ubuntu community. Plus, in the spirit of free and open source software, it is now a lot easier to make our software available to the Ubuntu community at large." More information on this significant milestone along with tips for testing and providing feedback can be found in the project's blog post. The OpenBSD team is taking a proactive step toward securing their operating system from potential, future CPU flaws. Mark Kettenis has published a patch which will disable hyper-threading, a move which the developer hopes will protect OpenBSD users against future Spectre-like CPU attacks. "SMT (Simultaneous Multi Threading) implementations typically share TLBs and L1 caches between threads. This can make cache timing attacks a lot easier and we strongly suspect that this will make several Spectre-class bugs exploitable. Especially on Intel's SMT implementation which is better known as hyper-threading. We really should not run different security domains on different processor threads of the same core. Unfortunately changing our scheduler to take this into account is far from trivial. Since many modern machines no longer provide the ability to disable hyper-threading in the BIOS setup, provide a way to disable the use of additional processor threads in our scheduler. And since we suspect there are serious risks, we disable them by default. This can be controlled through a new hw.smt sysctl." Earlier this year we reported that Red Hat was acquiring Container Linux (formerly CoreOS). An interesting side-effect of Red Hat adding Container Linux to its list of open source technologies under the name Red Hat CoreOS is that Fedora will become a proving ground for new technologies going into future versions of the operating system. As Matthew Miller writes, this will result in a new flavour of Fedora called Fedora CoreOS. "What does this mean for Fedora Atomic Host and other deliverables? This isn't the place for technical details - see 'what next?' at the bottom of this message for more. I expect that over the next year or so, Fedora Atomic Host will be replaced by a new thing combining the best from Container Linux and Project Atomic. This new thing will be 'Fedora CoreOS' and serve as the upstream to Red Hat CoreOS." Further details can be found in Miller's post and on the new website for Fedora CoreOS. Lots of people would like to use Linux for their audio projects, but may not know where to start. Author Peter Reppert has decided to help by writing a handbook for Ubuntu Studio which explains how to get started creating audio tracks, mixing tracks, adding effects and mastering CDs. "With discussion, Peter decided to release the entire book and have it uploaded onto the Ubuntu Studio User Wiki as a living document, complete with updates provided by himself and the rest of the Ubuntu Studio documentation team. Our long-time developers saw this as something they wished they would have had when they started using Ubuntu Studio years ago." The handbook can be accessed for free on the Ubuntu Studio wiki. The Debian project has released fresh installation media for Debian 8 "Jessie". The new media does not represent a new version of Debian, but provides installation discs which include security updates and fixes for packages that have become available since Debian 8 was originally released. "The Debian project is pleased to announce the eleventh (and final) update of its oldstable distribution Debian 8 (codename Jessie). This point release mainly adds corrections for security issues, along with a few adjustments for serious problems. Security advisories have already been published separately and are referenced where available. After this point release, Debian's Security and Release Teams will no longer be producing updates for Debian 8. Users wishing to continue to receive security support should upgrade to Debian 9, or see the LTS wiki for details about the subset of architectures and packages covered by the Long Term Support project." Getting-a-head-count asks: How many computers (approximately) in the world run Ubuntu or other flavours? Counting servers, desktop and laptops. DistroWatch answers: One of the benefits of running Linux is that it is nearly impossible to get an accurate count of the users of any one distribution. If that doesn't sound like a benefit, consider how companies usually get usage statistics. To get a count of the number of users, or computers a piece of software is installed on, there needs to be some way to uniquely identify and get reports from each person or system running the software. The counting process might use on-line registration or sales figures or registered e-mail addresses or a unique identifier sent along with update requests. One way or another, companies that can provide accurate usage figures need to be tracking their users somehow. With most Linux systems getting an accurate count is difficult. We can count the number of times an ISO is downloaded, but not how many times it is used to install the operating system. We can count unique IP addresses that request updates, but that will only give one address for institutions like small businesses and schools. We can count the number of times a core component is downloaded, but that ignores package caches, mirrors and so on. We can also run into situations where an operating system is tried and then quickly replaced with something else, which often happens in the Linux community, inflating the numbers. All of this is to say it is really hard to estimate the number of Ubuntu users, let alone the number of installs of community flavours or other Linux distributions, because the users are not tracked. Getting an accurate count is like looking at a swarm of insects and trying to estimate the number of individuals based on the size of the cloud they form. Over the years Canonical has tried to get some rough estimates, based on downloads and stats provided by other services. For example, last year they estimated 60 million Ubuntu containers had been launched by Docker users. They also guessed that around 20 million Ubuntu Cloud instances had been set up in 2015. As of about three years ago, Canonical suspected they had over 40 million desktop users, though how they got that number and whether it included community editions was unclear. 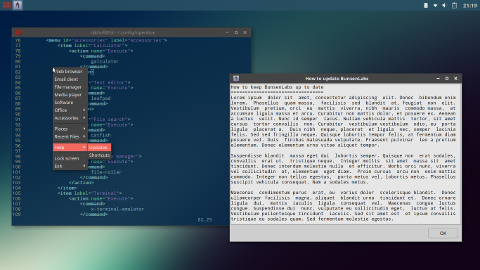 Tomasz Jokiel has announced the release of Porteus Kiosk 4.7.0, the latest stable build of the project's specialist Gentoo-based distribution designed for web kiosks (with Firefox and Chrome browsers): "I'm pleased to announce that Porteus Kiosk 4.7.0 is now available for download. Major software upgrades in this release include: Linux kernel 4.14.50, Mozilla Firefox 52.8.1 ESR and Google Chrome 66.0.3359.181. Packages from the userland are upgraded to portage snapshot tagged on 20180616. The latest kiosk release brings more work on mitigitng the Spectre vulnerabilities through updated CPU microcode and kernel patches. The newly discovered 'Spectre Next Generation' vulnerabilities require updated microcode from Intel which is not available yet. Please consider enabling automatic updates service for your kiosks to receive latest fixes and patches as soon as they become available. Short changelog for 4.7.0 release: it's now possible to explicitly set the shutdown options which should be present in the kiosk shutdown menu; added support for refreshing browser webpage with defined time interval...." See the release announcement and changelog for more information. Red Hat has announced the release of Red Hat Enterprise Linux (RHEL) 6.10, the latest version of the distribution's legacy branch with security support until November 2020: "We are pleased to announce the availability of Red Hat Enterprise Linux 6.10, the latest update to the Red Hat Enterprise Linux 6 platform. For nearly eight years, Red Hat Enterprise Linux 6 has carried our customers’ critical infrastructure because of the stability, reliability, and platform security that it can offer to the modern enterprise. Red Hat Enterprise Linux 6.10 marks the transition from the Maintenance Support 1 lifecycle phase to the Maintenance Support 2 phase. In order to help provide customers with a stable environment for the remainder of the Red Hat Enterprise Linux 6 lifecycle, only critical security fixes and business-impacting urgent issues have been addressed. Examples include the addition of retpoline-based mitigations for the Spectre/Meltdown vulnerabilities, an updated GNU Compiler Collection (GCC), and rebased gcc-libraries packages." See the release announcement and release notes for more details. Peppermint OS is a lightweight, Ubuntu-based distribution that features a desktop environment made up of Xfce and LXDE components. The project's latest release, version 9, is based on Ubuntu 18.04 LTS and features several small changes. "We have replaced lxrandr with xfce4-display-setttings for monitor settings as we continue to look for better options that add functionality without adding weight, and to continue the migration away from the few remaining LXDE components. By user request the Menulibre menu editor is now installed by default, and no longer breaks the menus as it did in previous Peppermint versions. Continuing the theme of improved menu and launcher management, there is now a right-click 'Create new launcher here' desktop context menu item. The Nemo file manager now has a right-click 'Send by email' context menu item. (requires an email client such as Thunderbird to be installed). The Panel Reset function in the Peppermint Settings Panel no longer needs to log you out of your session to reset the panel. The Xfce Panel Switch utility is now installed by default, so you can now backup/restore any custom panel configurations and switch between them. It includes a Peppermint-9 default profile and a few others to play with. The system Notification Settings (in the settings panel) now has a 'Do Not Disturb' function, or notifications can be enabled/disabled on a per application basis." A complete list of changes can be found in the release announcement. In our News section we reported that FreeBSD has officially turned 25 years old this past week. FreeBSD is commonly used as a server operating system and has also been used as the basis for various end-user systems. FreeBSD code and utilities have found their way into many modern operating systems, including macOS and the PlayStation 4. This week we would like to know if you have used FreeBSD directly, used a service which is based on FreeBSD or used an operating system which uses a significant amount of FreeBSD code. You can see the results of our previous poll on preferred init software in last week's edition. All previous poll results can be found in our poll archives.